Oneta is located on the top of the Valley of Riso and from the valley floor you can admire the slopes that open as an amphitheater through the tops of two mighty mountains of the region, Alben (6624 feet) and Grem (6722 feet), from whose slopes flows the stream Riso. Most of the territory is covered by forests of beech, fir, larch, birch and alder. Human settlements in Oneta are ancient. The first are dated back to the pre-Celtic populations and the Camuni civilization. After the Celts followed the Etruscans, the first to understand and exploit intensively the mines of zinc and lead in the area. In the period of Roman expansion in Upper Italy, Oneta was allied with the Gauls, but with the defeat of 196 BC Oneta became the Roman Alnetum. The great wealth of the area comes from the mines that continued to bring prosperity and commercial advantages even during medieval times. During the barbarian invasions Alaric’s Goths and the Huns of Attila reached Oneta and the Lombards of Alboin even settled there. 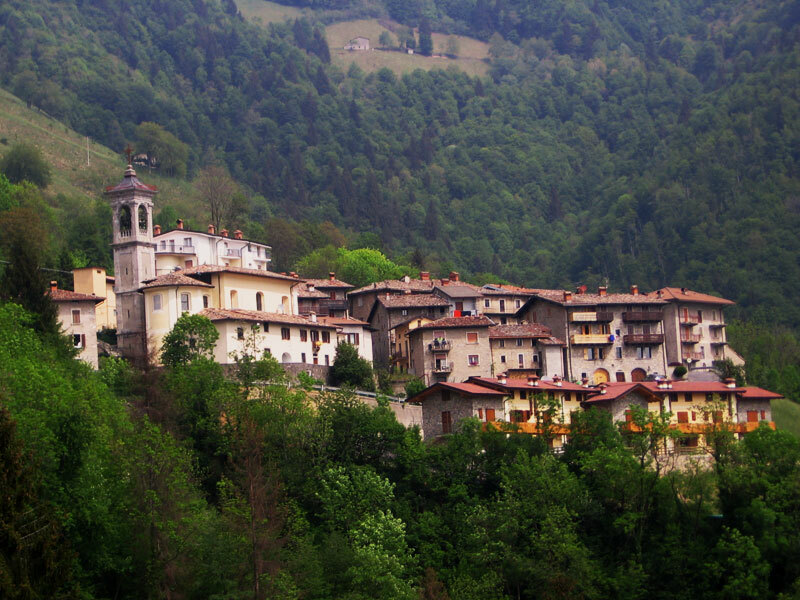 The medieval documents of Carolingian period suggest that Oneta and the upper Seriana Valley were transferred to the Abbey of St. Martin of Tours, who gave it to the bishop of Bergamo. Oneta became a separate municipality in the twelfth century; the bishop gave some of the lands within its jurisdiction to the newborn commune. Finding himself at the center of the struggle between Guelphs and Ghibellines, in 1427 a delegation from the town went to Venice to voluntarily submit to the venetian authority. Serenissima Republic of Venice gave back to the area peace and prosperity that the previous period had canceled. With the sale of Venice to Austria, Bergamo and Brescia became jurisdiction of France and after the Congress of Vienna (1814), the mountainous provinces became part of the Lombard-Venetian Reign controlled by Austria. In the twentieth century Oneta and Gorno were united, but then split again due to the protest of its inhabitants. After the Second World War, ended the mining activity in Oneta, with the subsequent closure of the mines.